For these pretty construction paper collages you can reuse leftover scrap paper to make a beautiful picture. 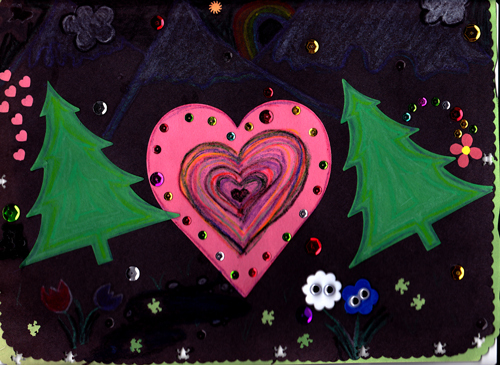 Cut out and glue shapes onto black construction paper and color the background with crayons or colored pencils. Use black construction paper as a background to make the colors in your collage really stand out. Crayons and colored pencils will still show up over the black paper and you can also color on lighter paper that you have added to your craft. Big flowers, rainbows, and hearts are a few ideas to get you started, but wil a little imagination, you will be coming up with tons of pretty pictures! This craft is pretty self-explanatory and results will vary based on what kid of materials you use. You will simply use your imagination to create a pretty picture, made out of whatever materials you have around. You might want to create an example to show your kids what you will be doing before they start, or you can just give them the materials and let their creative spirits run free! I had a bunch of extra die cuts lying around so I used them to make the construction paper collage shown in the picture above.I also added some plastic buttons and google eyes to my craft. If you don’t have die cut shapes then just cut shapes out of scrap paper. You can even use a fun hole punch and sequins to decorate the collage. Check your local art store for more ideas!